Thomas Woewiyu returns from lunch during jury selection Monday in his immigration fraud trial at the federal courthouse in Philadelphia. 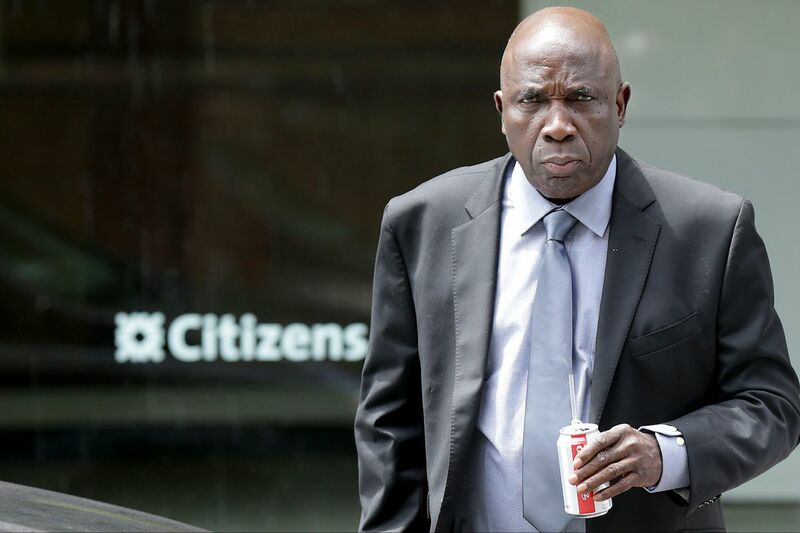 As his federal trial opened Tuesday, a prominent member of Delaware County's Liberian community was cast by prosecutors as a war criminal who operated in the "highest echelons" of a murderous regime and then lied about it decades later when he applied for U.S. citizenship. But lawyers for Thomas Woewiyu of Collingdale described their client as the victim of another deception — one by a Justice Department intent on righting the wrongs of a decades-old conflict by hiding behind a misguided immigration case. "This isn't history class. This isn't debate club," Woewiyu's lawyer, Catherine Henry, said in her opening remarks. "This is federal court, and Tom is charged with federal immigration crimes, not war crimes." Those salvos opened an unusual court proceeding set to play out in Philadelphia over the next three weeks – one that has captured the attention of Liberians here and in Africa. Prosecutors allege that Woewiyu – a 72-year-old grandfather who has legally resided in the United States for a half-century – oversaw rebel forces that committed atrocities during the civil war that ravaged the West African nation in the early 1990s. Soldiers under his command, they said, systematically raped, tortured, and executed civilians, and turned enslaved children into weapons of war. But despite those gut-wrenching claims, the charges Woewiyu faces revolve around a simple immigration question: Did he lie on his U.S. citizenship application about his role in the conflict? The government contends that Woewiyu hid his past as chief spokesman and defense minister for the National Patriotic Front of Liberia (NPFL), helmed by strongman Charles Taylor, who later became president of the country. "You can't commit human rights abuses in your own country and come here and expect to obtain citizenship," Assistant U.S. Attorney Nelson S. T. Thayer Jr. said in his opening remarks. More than 200,000 people died in the multifaction conflict that erupted in Liberia's jungles and bush between 1989 and 1997. But no one has been convicted of any of the documented war crimes committed during the conflict. In his role as spokesman, Woewiyu served as an "acceptable public face" for Taylor's murderous regime, whether as a voice emanating from tinny speakers during radio interviews or as a front-line commander of troops, setting policies on how the war would be waged, according to the prosecutor. "The NPFL desperately needed that acceptable face because what the NPFL was doing on the ground … was far from acceptable," Thayer said. He warned jurors that testimony they will hear in the days to come would contain graphic descriptions of torture, dismemberment, and child abuse — much of it from the nearly two dozen witnesses flown in from Liberia. Among the first to testify Tuesday, Liberian journalist James Faseukoi teared up as he described his own certainty that he would be killed as Taylor's forces invaded Monrovia, Liberia's capital, during the summer of 1990. Then a boy, Faseukoi said he and his foster brother hid under their bed as rebels dressed in filthy women's wigs and toting AK-47s opened fire in civilian-packed streets. "We thought we were going to die," he said. "We were fighting over the one little Bible we had as if that were going to save us." Jurors are also expected to hear from several ex-NPFL fighters who, according to court filings, will say that they served as members of Woewiyu's private security force. "These were children, some as young as 10 years old," Thayer told the panel. "Their AK-47s in some cases were taller than they were and were dragging on the ground behind them. Tom Woewiyu expected those children to put their lives on the line for him." But his lawyer, Henry, dismissed such testimony as a distraction, laying out a strategy that cut to the heart of one of the unique aspects of the case – the use by U.S. authorities of criminal immigration law to hold what defense lawyers have described as a "back-door war crimes tribunal" for acts committed abroad. "Perhaps they genuinely want to hold someone accountable for the trauma the Liberian citizens experienced in Africa three decades ago," Henry told the jury. "But the United States doesn't have the jurisdiction to prosecute war crimes that happened in Africa. There's nothing they can do in this courtroom to change that." Thayer and fellow prosecutor Linwood C. Wright Jr. used a similar tactic last year to convict Mohammed Jabateh, a former warlord who fought under the nom de guerre "Jungle Jabbah" in opposition to Taylor's forces during the '90s. Jabateh also stood accused of lying to immigration authorities — for him, it was on an application for political asylum – and is now serving a 30-year prison sentence, one of the longest imposed in a case of its kind. But while Jabateh lived in relative anonymity after arriving in the U.S., Woewiyu's lawyer argued that he had never tried to hide who he was or even the violent excesses committed by soldiers fighting on his side. After arriving in the U.S. on a student visa in 1969, Woewiyu helped form the NPFL in the late '80s with others opposed to the oppressive regime of then-Liberian President Samuel Doe. During the war, Woewiyu met frequently with U.S. diplomats and later with federal investigators as they mounted a bid to deport another of his countrymen, George Boley, for his own wartime conduct in 2012. Woewiyu, dressed in a dark suit and red tie, looked relaxed during much of Tuesday's proceedings, leaning back in his chair, chewing gum, and occasionally pausing to whisper to Henry and co-counsel Mark Wilson. His supporters could be heard chortling in the back row during testimony from one Liberian war victim. "Convicting Tom isn't going to rewrite history," Henry said. "It's not going to undo any of what happened during the Liberian civil war."